Fuse began its work on the Victoria Gate Casino as long ago as 2012 when Global Gaming Ventures (GGV) approached us to assist them in putting together a credible bid for the coveted 2005 Gambling Act license in Leeds – one of only eight ‘large’ casino licenses in the UK. At the time, GGV didn’t have a site or a development partner. We reacted quickly and put together a shortlist of potential sites. 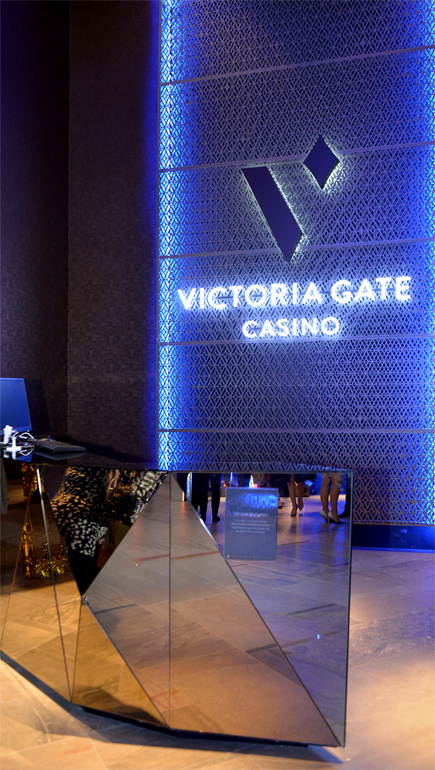 To cut a long story short, GGV won the license competition just a few weeks later with a Fuse design for the new venue and a partnership with Hammerson plc to provide a home for the casino within their spectacular Victoria Gate retail development. Nearly 5 years, over 300 Fuse drawings and over 25,000 emails later, the new venue was unveiled to the public in January 2017. Staying with the statistics, the casino which is the size of 18 tennis courts cost £30m to turn into a reality and the casino has created more than 200 jobs in the Leeds City Region. 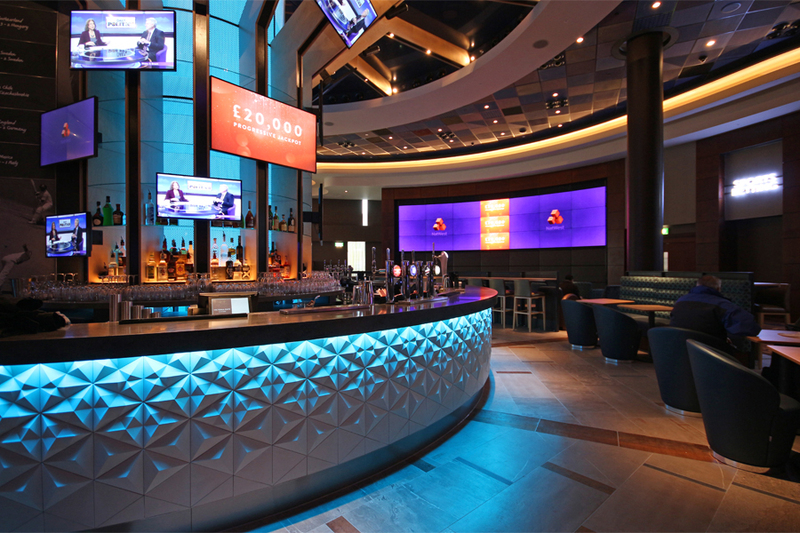 It boasts 24 gaming tables, 140 slots, 80 electronic gaming terminals and a 100 seat dedicated poker area – plus two spectacular bars and a restaurant. 432,000 bronze beads were used in the canopies over the gaming pits and 1.9km of carpet cover most of the floor (that’s around 8 tonnes) with about 50km of data cable concealed beneath it. There are 102 TV screens, of which 21 make up a huge video wall to show major sporting events. Fuse are not only absolutely excellent architects and designers, but they have also played a critical role in helping us to shape our overall customer proposition. Hence Fuse are true creative partners. We have found time and again that they are willing to go the extra mile to find the highest quality solutions, however difficult the problem. It has also always been a great personal pleasure to work with all the Fuse team and we intend to continue doing so for the long term." The casino sits at second floor over the retail arcades below and is actually arranged over three levels. This posed a huge challenge for the design team as casinos generally consist of a single flat floor. The philosophy was therefore to turn this disadvantage into a virtue and use the levels to create smaller, intimate zones such that the very large venue never feels very large to the customers using it. Another issue with gaming floors is that the slots and tables (and the customers) tend to block low level views so new visitors can struggle to understand the layout of the space. Here, the ceilings have been used to provide clues (a device known as ‘cognitive mapping’). 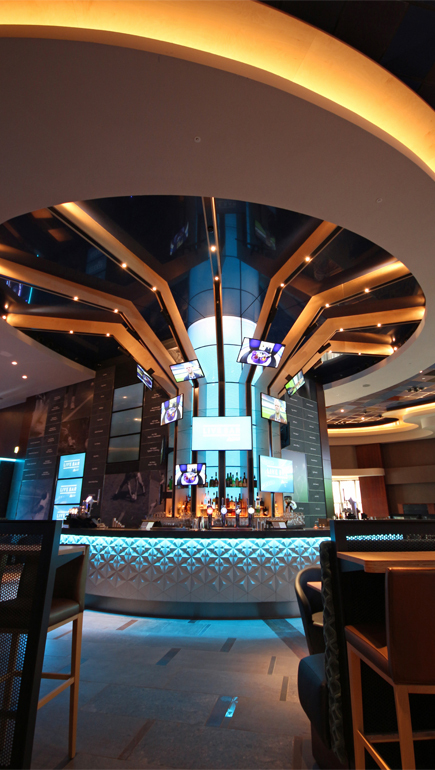 The gaming floor ceilings therefore have a curvaceous edge which tells the visitor where the space continues around the corner – encouraging exploration and distribution of people around the casino. This edge detail, which became known as ‘the blade’, is made up of a layer of birch plywood, illuminated from below by a concealed warm white LED light. Above it is the accessible ceiling, made up of a dozen or more different ceiling tiles, painted in a dozen different shades of blue and interspersed with steel and aluminium mesh tiles which allow the ceiling void to be used as a return air plenum. Another significant challenge was the height of the space. We wanted to maintain as much height as possible to make the casino as dramatic as it could be but we also had to deal with the need to provide lighting and cameras at low level over the gaming tables. The solution was the innovative pit canopies – hardwood-clad triangles that ‘float’ over the gaming tables with interchangeable panels on the underside containing speakers, lights and cameras. To reduce the impression of their weight, curtains of illuminated bronze beads encase them and extend upwards towards the ceiling, making them appear more delicate and at the same time creating a sense of intimacy at the tables below – despite the considerable true height of the room. By contrast, the two bars (right and below) make maximum use of the height. 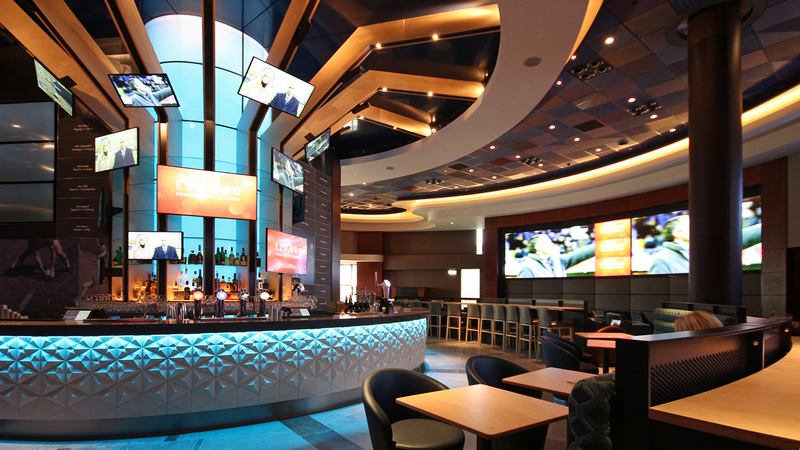 ‘Live’, the venue’s sports bar, is wrapped around an illuminated column of steel mesh framed with enormous plywood blades that support an array of flat screen televisions showing sports events whereas ‘curve’, the more luxurious cocktail bar, boasts a huge display of whiskies and champagnes as its backdrop. The Live bar front is clad in geometric Kaza concrete tiles, topped with a Corian counter top. The walls are clad in natural slates which are decorated with the names of famous sporting winners of the past. 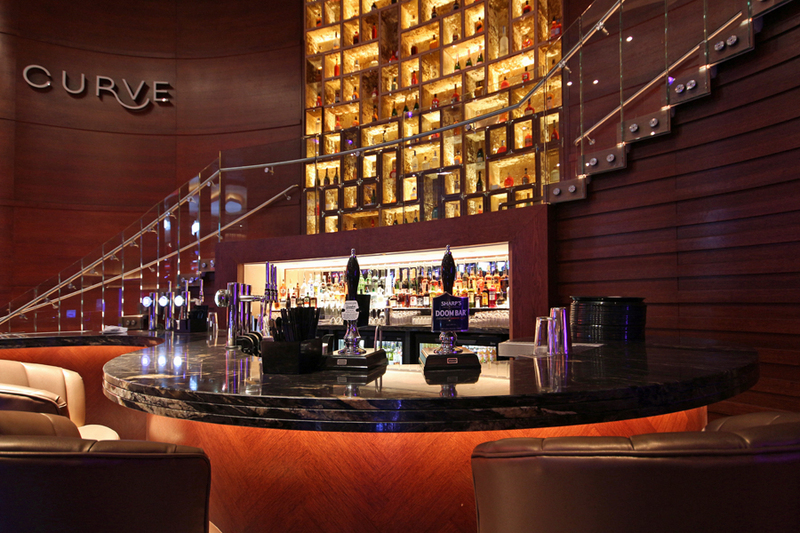 At Curve, the bar front is of herringbone, quarter-cut oak with a bar top of stunning, figured granite. The walls are of polished hardwood. The bars are very deliberately designed to appeal to different audiences – or to the same audience at different times. Groups of friends might gravitate to Live whereas couples might be more inclined to spend time at Curve. 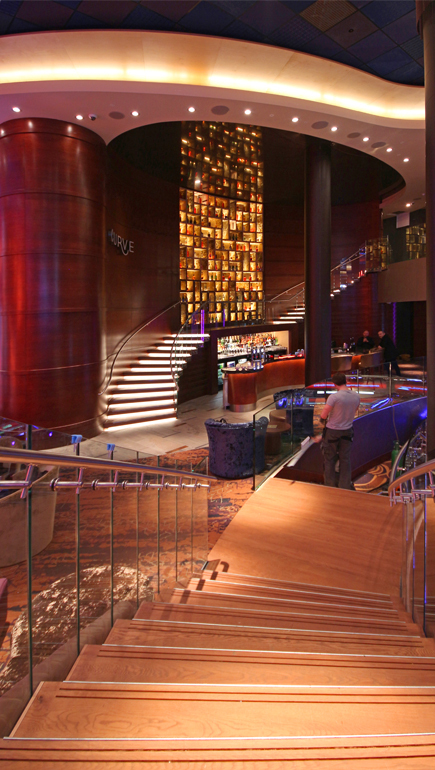 Live is situated close to the entrance and provides a convenient refuge for the first-time casino visitor. In terms of gaming content, the venue is divided into two main areas (with a third area at mezzanine level due to be opened in 2018). 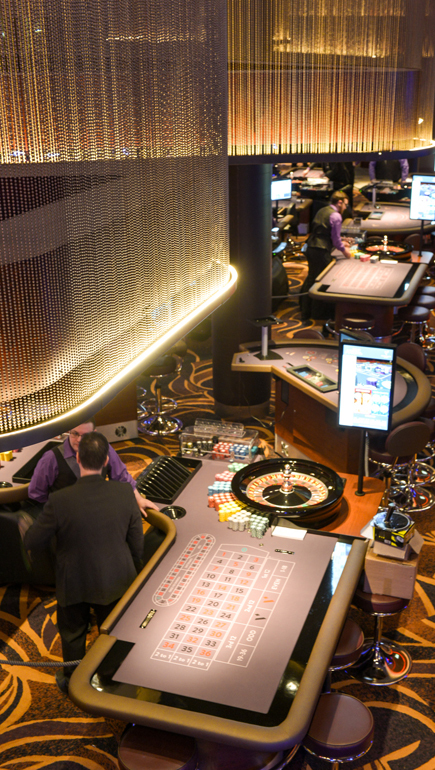 The upper gaming floor (top left) contains the largest of the gaming table pits and two distinct slot zones. This area is closest to the entrance and so is busy throughout the week and around the clock. 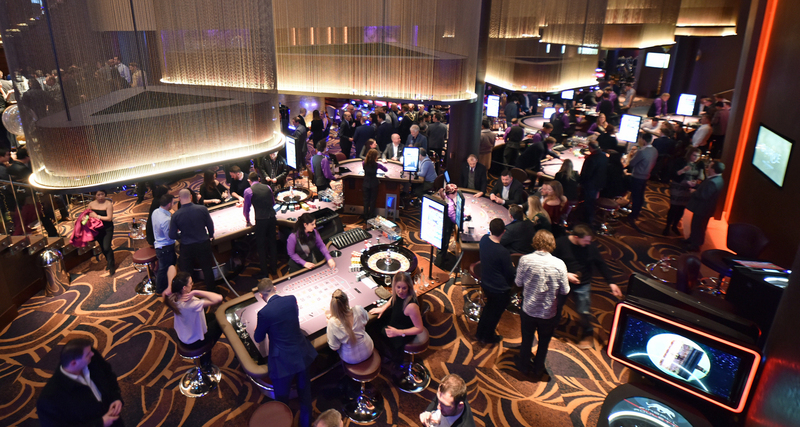 The lower gaming floor pit (bottom left) is slightly smaller and is overlooked by the V Restaurant, a 50-cover, up-market dining experience. At one end of the lower floor is the Poker area, currently home to ten tables. The lower floor comes in to its own on Fridays and Saturdays when well over 2,000 customers pass through the doors each day. The Fuse team was led by Director, David Matthews. Associate David Eastwood and interior designer Paul Henning lived and breathed the project for several years and both deserve medals. Tracy Heywood led on the FF&E and made an enormously important contribution on design – not least in her work on the Curve bar. Technical support came from Iain McDonald, Mandy Wright and and Professor Revit, Rob Moules. The project would never have been built without Sami Lee’s constant support on the project administration and constant, hot running caffeine. Just about all of the Fusiliers got involved at some point. The venue wouldn’t look half as good without the inspired work by our regular partners in crime – lighting designers extraordinaire, Technical Arts, under the leadership of Chris Filippidis. The complex mechanical and electrical design was by BSE3d from down South under the watchful eye of Phil Todd and Graham Bowes respectively. Project management and contract adminstration was provided by the hugely experienced Bob Turley of the Emeny Turley Partnership from Birmingham who indulged us often and still kept the project within budget. Cost consultancy and valuation was by Currie & Brown in the person of Geoff Cairns. Structural matters were under the stewardship of our local pals Mark Brady and Steve Bell at Roscoe; acoustic design was by Jason Clouston at Scotch Partners, John Hutchinson at Currie & Brown provided health and safety advice to Fuse in our role as principal designer. Craig Matthews (no relation) of Momentum Wayfinding helped us out with the signage. On site, the main contractor was Phelan Construction led by Darren McQuire and Danny McGowan back at the mothership and by a site team led by Chris Field with vital roles played by Shaun Carter, Rory Wilson, Paul Gardner, Craig Bennett, Paul Jones and Kathryn Wheatley. Mechanical installations were untangled by Hensall Mechanical Services under the leadership of Mark Levenston and Mark Robinson. Andrew Austin of DPS Electrical and his team laid more miles of cable than you can shake a stick at. Audio-visual installations were by the Willow team led by Chris Hampson, data installations were by IT Backbone under Jason Chaplin and security and CCTV was by Amberstone led by Andy Foster. Signage was by Spectrum Signs, furniture was supplied by Angus MacRae Interiors and the carpets came from Shaw Contract in the USA. Lifts and escalators were supplied (eventually!) by Kone and Schindler respectively. Our very sincere thanks go to our remarkable client, Global Gaming Ventures, notably Tony Wollenberg, Andrew Herd, Paul Sculpher and Deborah Roil. These four stalwarts were GGV in the early days and they placed an unparalleled degree of trust in the Fuse team to design a venue without all the usual client departments to dictate how things should be done. In the later stages, the addition of Patrick Noakes (Venue Director), Duncan Bachelor (Finance), John Davies (Food and Beverage) and Leanne McKenna (Marketing) allowed the loose ends to be tied off just in time!